Friday December 26th 1890 We soon got our work done up this morning and I rode over to Marys with Will. After dinner him and I went down to Aunt Marys for a turkey she sold me. I stopped in town awhile and was at Hatties. Edith came over before dinner. Mother went back with her to stay all night. Will and I were here alone and talked till eleven oclock. Saturday December 27th 1890 I was most of the day doing baking and fixing things for dinner tomorrow. Mother came home before noon and Anna came about three oclock. The weather colder. I was doing some mending in the evening. Sunday December 28th 1890 We got up very late but our morning work was done in good time. I had the Woolfs and the folks from town all over for dinner and we had such a good visit weather pleasant. I read and wrote in the evening. Monday December 29th 1890 It was a splendid day and Anna done the washing. I was sewing for Mother all day and worked in the evening on a shirt I was making for her. She was gone to town all the afternoon. Willie came tonight. Tuesday December 30th 1890 It was a very pleasant day. I finished Mothers shirt and fixed her cloak. We were both in town in the afternoon to see George Bremmers folks who were spending the day at Hatties. I came home early to attend to my evening work. I worked on a calico dress for myself in the evening. 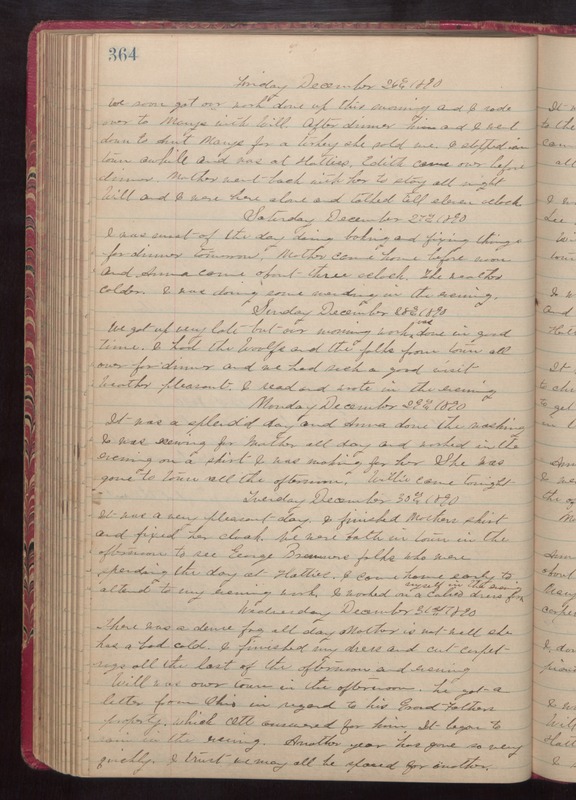 Wednesday December 31st 1890 There was a dense fog all day. Mother is not well. She has a bad cold. I finished my dress and cut carpet rags all the last of the afternoon and evening. Will was over town in the afternoon. he got a letter from Ohio in regard to his Grand Fathers property which Ott answered for him. It began to rain in the evening. Another year has gone so very quickly. I trust we may all be spared for another.